For a number of years an Australian Bahá’í resident in Singapore has been accompanying a group of young people aged 12 to 18 to visit the historic community of Bahá’ís in Daidenaw village in Burma. The Burmese Bahá’í community occupies a special place in the history of the Faith and its 800 strong population in Daidenaw are proud of their heritage. This heritage, coupled with an opportunity to learn how to be of service, made Daidenaw an obvious choice for the Singapore Bahá’ís to visit. 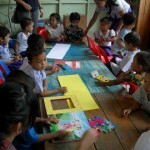 “I had no clear preconceptions about what it would be like in Burma, having read only a few articles and books about it. The motivation to go really came from reading a report written by a youth who had been to Daidenaw and the impact it made on her. I also knew that the Burmese Bahá’í community was established in the latter part of the 19th century when the Faith was less than 20 years old. It was the Burmese Bahá’ís who donated the marble for the sarcophagus that would later hold the remains of the Báb, Baha’u’lláh’s predecessor, now entombed on Mt Carmel in Israel and the site of pilgrimage for Bahá’ís around the world. We flew into Yangon after a 3 hour flight from Singapore. It is a typical Asian city although with fewer noisy motorbikes but still bustling with activity and people. We only spent one night there and in the morning all seven of us (4 adults, 3 youth) jumped into the back of two utes and set off for Daidenaw, situated west of Yangon on the Irrawaddy delta. The road is sealed now and there are few signs of the devastation wrought by cyclone Nargis in 2008. On either side of the road as we cleared the outskirts of Yangon were padi fields being ploughed by buffalo, women carrying baskets on their heads, homes built from wood and thatch squatting almost in the water, the occasional golden stupa rising out of the padi, cows wandering on and off the road, ducks in the grass, herds of goats here and there, and schoolkids in their green and white uniforms happy to wave to us as we passed. Upon arrival in the village, we were shown to the nursery school operated by the Bahá’í community which is just adjacent to the Bahá’í Centre. 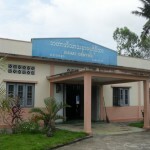 It consists of a long brick building with four classrooms and a toilet block. As we approached we could hear the sounds of children reciting in unison. We had brought gifts of secondhand and new books, simple wooden toys and puzzles, crayons and paper and a big bag of animal hand puppets. Apprehensive and a little bewildered at first, the children soon warmed to our presence as we engaged with them and introduced them to the materials. I was impressed with the orderliness and cleanliness of the classrooms and the natural discipline that pervaded the school. There was no shouting or fighting and there was a general atmosphere of peace and cooperation. The curriculum includes the teaching of virtues alongside the usual subjects of numeracy and literacy. Another building is ready to accept a further intake of students from surrounding villages. I got the impression these children are off to a comparatively good start and it felt good to have been able to contribute a little to the material resources of the school. I wondered how the village had become a Bahá’í village in the first place and it was explained to me that in the late 19th century a Bahá’í gentleman had stood surety in a court in Yangon for a complete stranger who happened to be the headman of Daidenaw village. Impressed that he would do this when no-one else was willing to help, the elders of the village invited the Bahá’ís to talk to them about their Faith. Thus it was that Mustafa Rúmí was asked to give a presentation and as a consequence the entire village of 800 people became Bahá’í. Rúmí managed to help them financially and they quickly established a school with the funds. He also helped the fledgling community in other ways, assisting them to administer the affairs of the Faith, and translating many of the Bahá’í Writings into Burmese. He settled in Daidenaw and, when the Second World War brought suspicion and hatred of foreigners into the nationalistic atmosphere that pervaded Burma, many Bahá’ís were targeted and cruelly murdered. In 1945 a mob attacked the Bahá’ís in Daidenaw, and Mustafa Rúmí was beheaded and his body chopped into pieces. Today a shrine in his memory has been erected inside the compound of the Bahá’í Centre. The shrine is a special and significant place in the history of the Faith in Burma, and we spent an afternoon applying some tender loving care to make it sparkle and gleam in the warm Burmese sun. Many curious children came to help us! The next day we were taken by boat via the canals that link the padi farms and which are the only effective means of transportation in the delta. The water was muddy and we were so low in the water it was difficult to see very much of the surrounding area. 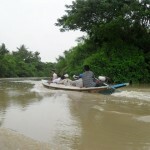 We passed fishermen casting their nets into the water, buffalo ploughing the fields, and thick vegetation that lined the banks of the waterways. In the midst of all the padi we suddenly found ourselves outside a house on stilts with a sign proudly proclaiming it was the Bahá’í Centre! The farmers and fishermen had taken time off to come and visit us, and had prepared snacks of fruit, tea and biscuits. We all sat around on the woven mats and each of us spoke a little about our experience in Burma and why we had come to visit. Our hosts from Yangon ably translated for us. It was a surreal moment for me as I realised that in this remote corner of the world a community was engaged in building a civilization based on spiritual principles such as trustworthiness, justice, service and equality. We were miles away from what the developed world might term “civilization” but in my mind this was surely far superior albeit far less materially developed! 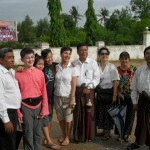 I think all of us were deeply touched by the warm hospitality we received in Yangon and Daidenaw. We felt not so much that we had been of service to a community less well off than our own, as we were privileged and honoured to have been the recipients of the sincere love and genuine consideration of these pure-hearted people. There is no doubt that the youth that we accompanied established real bonds of friendship with the youth and the children in Daidenaw, and the fact that they could communicate with each other despite the language barrier was testament enough to the ideals inherent in the writings of the Bahá’í Faith that “the earth is but one country and mankind its citizens”.